I know that many of my readers are quite familiar with this kitty. I have blogged about him many times, and perhaps you have even seen this image of him. Well, he now has a buddy. And there is no way I can even get close enough to pat her, forget about take a picture of her. 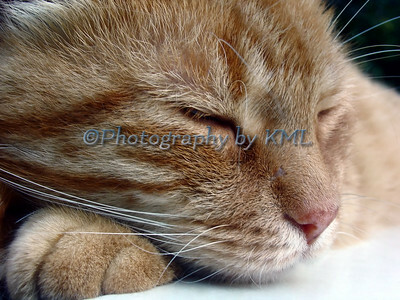 Rusty, the above cat, is feral and has been living around us for over 10 years now. He is beginning to show his age, whatever that may be. There have been several other feral cats around through the years, but they never stuck around - Rusty always chased them off. This new youngster has made itself quite at home with Rusty, and the elder cat does not argue about it at all. The thing is though, the new cat has a collar with a tag. And try as we might, she will not let us get close enough to her to read it. She has been living with Rusty for over a week now and hopefully she will see that even though he is wary of us, he trusts us enough to pat and feed him. We have been calling the kitty a "her" but the tag might tell us it is a "he"
Hopefully she will befriend us soon so we can help her if she is lost and not feral. This is the seventh round of ABC Wednesday. If you would like to join in please visit this site for the details. 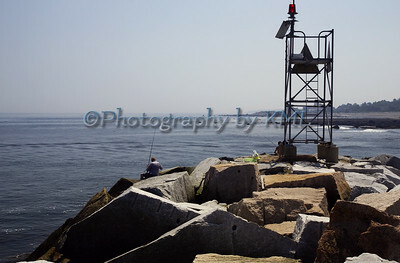 A favorite place for the boys to fish when we visit the ocean is the breaker wall or jetty in the harbor. Most people who fish here all go out to the end too - there is much evidence to prove it. It makes it hard to find a "clean" surface to sit on out there. There are various fish and bait remains of all kinds in several stages of decay on these rocks. Some have petrified and completely dried in the sun, others have not. You would think with all the water around these rocks would be fairly clean. Or the seagulls would have picked them all clean. What they need is a good ole New England summer storm to get them washed off. I am sure Mother Nature will take care of it in her own time. A different angle for this view of the harbor. Crouched behind the dried grasses that were growing along the edge of the rocks, the ocean water is barely visible beyond the overgrowth. This is the same spot that we ate our lunch on that hot summer day. I captured the image just as a boat was passing by. I was pleased with the exposure and focus of both the grass and the water. Love the old buildings in the old historic towns along the seacoast. And the ivy that is creeping up the side of the roof is Mother Nature's art work on these old buildings. 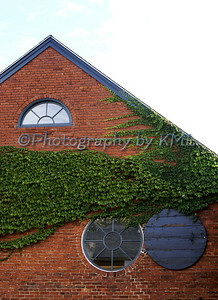 The round window with the ship's steering wheel design caught my eye right off - the ivy was an added bonus. I didn't notice until I got home and was processing the image that it was going up the roof like that. Hopefully the owners of the building left it, but most usually have someone come and remove once it gets too wild especially around the windows. 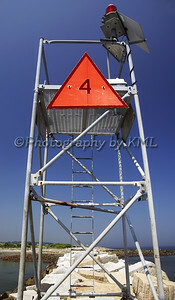 In my last post I was walking down the breaker wall in the harbor. With much determination, I made it to the end. I was standing directly in front of the harbor marker for this photo - this is the view that the boats going by get as they pass the end of the wall on the way out to the open ocean. The wall doesn't look that intimidating from this angle. The wide angle lens that I had to use to get the whole structure in the photo doesn't allow much for details. Notice in this image the blue sky. It was taken about 45 minutes from the one in the previous post. I was facing west in the first image - and the sun was heading that way too. I was facing east in this one - the sun was at my back. The conditions had not changed at all, but the first photo looks overcast and hazy. The second one is clear and so blue. There was some haze that day, but it just shows how different the light can be depending on the photographer's angle to it. 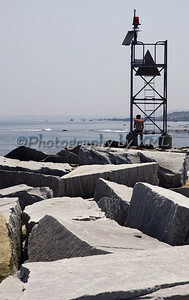 Both of the boys were out there at the end of the breaker wall when we visited the ocean earlier this summer. I can usually get about half way down this wall, then the large rocks start getting just a bit too far apart for my liking. I'm not the nimble youngster I used to be, but that is not the problem. It's those large spaces with nothing in between them that I have to step over. The fear sets in, and I immediately sit down on the rock I'm on. Don't want to fall with my camera gear - those spaces make me dizzy. After a pep-talk of mind over matter, I try again. A couple more rocks, and another sit-down. This has been going on for at least a half an hour now. My son has been back a couple of times to help me - he literally runs down these rocks to me. I envy that and tell him, I'm getting there - I'll wave when I need help. Most times I never make it down to the end. But this past time, I did. And I will have photos in future posts to prove it! It was the hottest day of the summer when we decided to head to the ocean. We all thought it would be so much cooler there, but man, were we wrong. Nothing was stopping the heat - not even that ocean that looked so refreshing. 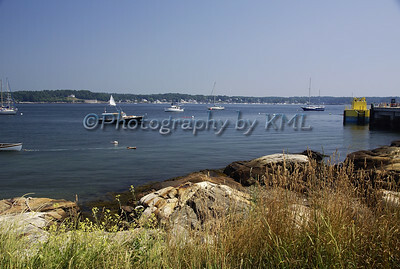 This is the view of New Castle harbor that we had while we were eating our lunch. 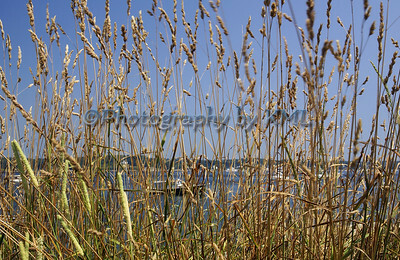 A nice quiet spot with a picnic table in the grass, and a great view to the entrance of the harbor. The tide was about 1/2 way out, and the boys did some fishing there right after we finished eating. I did some exploring with my camera and had what I think was a better time than they did. I had no fishy smelling hands, no slimy bait to deal with, and best of all, I discovered the coolest spot to be found that day. Yep, life was definitely good on that ocean visit! The winds have been up and the swimming these last two days has been so rough. Today wasn't as bad as yesterday, but it was still quite a workout fighting the waves as we swam against the wind. I would not have been able to swim yesterday if I didn't have a pair of flippers to use - I would have been completely swamped by the waves and swells. 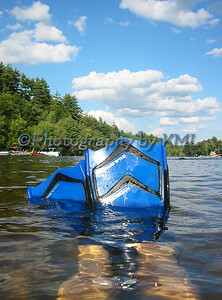 I started out the season using my fins, but I gave them up over a month ago - it made swimming much too easy. Not so easy on the legs, but I didn't have to use my arms, and I didn't feel I was getting all the benefits swimming provides. I figured, if I was willing to brave the chilly waters, I might as well get the full body workout. I do know one thing - I will surely miss this exercise once the water becomes too cold. Hope it isn't for another few weeks! Lots and lots of green. 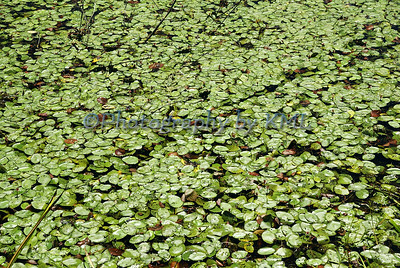 Back to the swamp for this one - the little lily pads are crowding their way to the surface. They all want a piece of the sun and they almost completely cover the top of the water. They are a smaller variety, so perhaps that is why there are so many. This little environment is supporting many different kinds of life, and is is good to see it so healthy. This image was taken towards the end of July - I was hoping to catch the water lilies in bloom. We went back a couple of weeks ago to see how they were coming along, and it was quite a disappointing scene. I will post some pics in the next couple of weeks of my beloved swamp.